For Class II, Div. I, Group G.
316-2b stainless steel on product contact surfaces. Inlet valve with positioner (shipped loose) for field mounting to surge hopper. Power-Lift™ fill head height adjustment system. Material inlet tube features automatic CIP (clean-in-place) system, dust take-off and inflatable spout seal. Bag inflation system with inlet air filtration package. Loop-Lok™ pneumatic bag strap release system accepts accommodates bag sizes. Filler includes gain-in-weight scale system for reliable weighments. Powered deck includes bag densification system with pop-up frame and scale isolation. 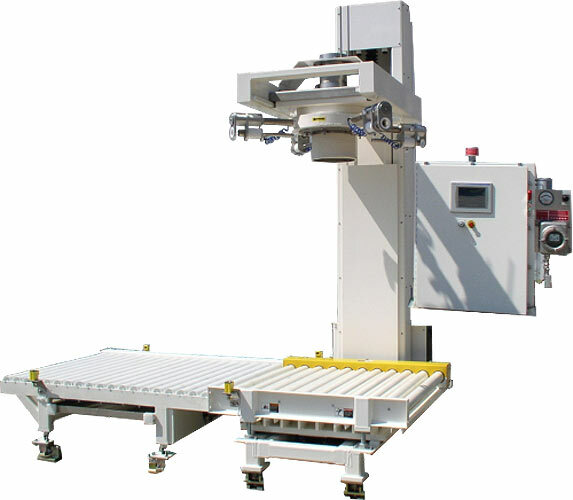 Includes check scale with powered roller conveyor top and weight indicator. Carbon steel sandblasted, then powder coated RAL #9010 (Pure White). A/B SLC 5/05 PLC with A/B Panelview color operator interface for easy operation. Includes custom programming with recipe management and conveyor system integration. NEMA 4 pressurized enclosures; motor starters can be reset from the Panelview terminal.